As usual, Seth is simple and short, whereas my own 3-part Squidoo tips tutorial on how to build web traffic is in-depth and too long. You have no right to traffic. If you’re lucky, and GOOD, you earn some. You’ll earn it when you do something daring, interesting, useful, provocative, free, compelling, emotional or urgent. I’ve said this in other ways, but never quite so bluntly: YOU HAVE NO RIGHT TO [WEB] TRAFFIC. There are millions of fascinating, useful, incredible, wonderful, exactly-what-people-want web pages out there. A web user will never see more than a tiny fraction of them. So why should anyone pick your page, out of all those pages, to visit? Why stay there? Why read it? It’s up to you to make it worth their time. I just noticed on my “Is Squidoo a Scam?” lens that someone said he’d made four lenses and hadn’t earned any money in six months, and he was giving up. On the one hand, it IS hard to get web traffic. On the other hand, he hadn’t filled in his profile, he only had ONE lens left in his profile, and it was on a very popular topic for which there are over 970,000 webpages, according to Google. 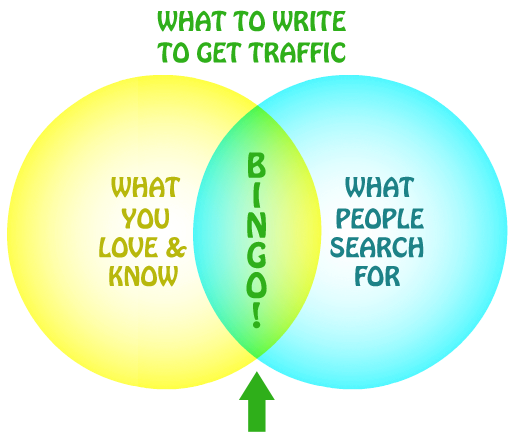 Newbies write on popular topics, thinking they’ll get lots of traffic. They don’t realize that popular topics have thousands if not millions of pages already written on them, and they’re competiting with all those pages. Okay, I’m preaching to the choir. The point is, you can’t assume a page will get traffic. It really is work to make useful, unique, readable, entertaining, grab-the-visitor-by-the-throat-and-make-them-stay webpages. What can you do to boost the odds? Write on what you LOVE and KNOW. Passion, humor, and real in-depth knowledge shines through. Write on things that aren’t the most popular topic. Think of things you’ve looked up online or wondered about. Think about things you know which are off the beaten track. Lionel trains? Your town’s traditions or landmarks? A particular product, book, author, body part or animal? Seek topics that haven’t been done to death. Research, research, research. Not only do you want to cover the most important things about your topic, but you should find and link to the best websites and videos on your topic. Organization. Make it clear what your page is about, where you’re going to take your reader, and what they’ll get out of your lens right in the introduction. See my top ten Squidoo tips for some other ideas about how to make your lens stand out. Once in a while, make a list of ten webpages you’ve visited. Then write down the following. What brought you there? Did you read the webpage all the way through? What on the page held your attention? If you clicked on any links, why did you click them? If you did NOT read the whole page, why? What did you skip? What did NOT hold your attention? Your tastes aren’t everybody’s, but the more you understand what keeps people on a page — and what doesn’t — the more you’ll be able to write successful webpages. The bottom line: your lens has to be useful, entertaining and/or informative, NOT generic. You have to “earn” your traffic, as Seth puts it. And then use as much SEO as you can to get your content found. Posted in: Squidoo, Thinky Thoughts.